A person with ankylosing spondylitis (AS) will likely have stiffness and pain at the base of the spine and lower back. AS pain tends to be worse in the morning and may awaken the sufferer at night. AS pain typically decreases with physical activity and increases with rest. A person who is suffering from the preceding symptoms should see a primary care physician or a rheumatologist. According to the American College of Rheumatology, a rheumatologist is an internist or pediatrician who had additional training in musculoskeletal disease and systemic autoimmune disorders that are called rheumatic diseases. Rheumatic diseases affect joints, muscles, and bones, resulting in pain, swelling, stiffness and, for some, deformity. A diagnosis of AS usually includes a physical examination, imaging, and laboratory tests. A primary care physician or a rheumatologist would be likely to begin with a physical examination. The physician would check range of motion by having the patient bend in different directions, forward, backward, and sideways. The exam could include testing for pain that is experienced with leg movement. The physician might apply pressure to various parts of the pelvis to determine test for pain in the pelvic bones and joints. The physician might use deep breathing to test for involvement of the rib cage, which, if involved, would constrict deep breathing. X-rays would likely reveal changes in bones or joints, although those changes may not be visible if early disease is present. 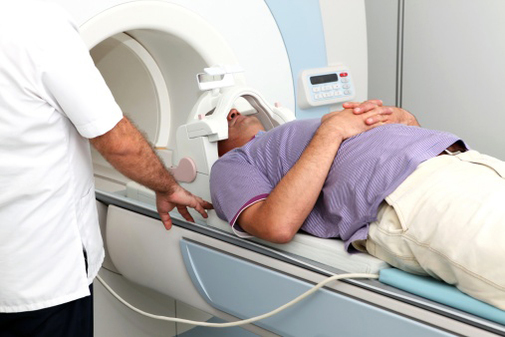 Magnetic resonance imaging (MRI) would use radio waves and a magnetic field to show greater detail. Signs of early disease not seen on x-rays are usually visible in an MRI. Because an MRI is expensive, the doctor might want to delay the test to see if future x-ray imaging reveals AS signs. 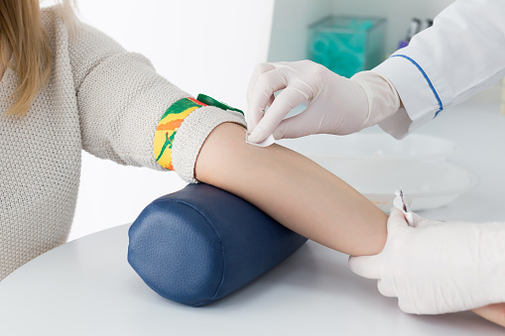 While no specific test can diagnose AS, certain blood tests indicate biomarkers associated with inflammation. A test for the HLA-B27 gene can help confirm a diagnosis, but it’s important to keep in mind that most people with that gene do not have AS. In people with AS, fewer black people with AS have HLA-B27 than white people with AS. The reason is unknown, but the presence of the gene may help to confirm the diagnosis. Imaging tests assign “grades” to gauge sacroiliitis (inflammation of joints connecting the lower spine and pelvis). AS is confirmed if imaging reveals at least grade 2 sacroiliitis on both sides, or grade 3 or 4 sacroiliitis on one side. The meaning of each grade, provided below, reflects conventional radiology diagnostic standards. Grade 1 is suspicion based on blurred joint margins. Grade 2 is minimal abnormalities known as sclerosis (tissue hardening) and erosions (bone loss). Grade 3 is advanced sclerosis (hardening of tissues) and erosions (bone loss) with widening joint space. Grade 4 is extreme sclerosis and erosions with complete rigidity. What if imaging tests show nothing despite persistent symptoms, which is often the case with early AS? Thanks to the Assessment of Spondyloarthritis International Society (ASAS), additional criteria can help confirm a diagnosis of early disease that can’t be confirmed by the 1984 Modified New York criteria. Per Box 4 in the ASAS handbook, the following criteria aid in the diagnosis of early AS. For patients with at least 3 months of back pain that began under age 45, AS is confirmed by (1) at least 1 clinical feature and (2) a radiographic image or, if negative, an MRI that shows active inflammation. Remember, the more-sensitive MRI can show disease activity not yet detectable in an x-ray. having at least 2 AS clinical features. What are the ASAS clinical features? Inflammatory back pain, arthritis, heel pain (enthesitis), eye swelling with pain/blurred vision (uveitis), toe or finger inflammation (dactylitis), chronic inflammatory skin problem with scaliness (psoriasis), chronic inflammation of the digestive tract (Crohn’s or colitis), good response to nonsteroidal anti-inflammatory drugs (NSAIDs), family history for AS, presence of the HLA-B27 gene, and elevated C-reactive protein (CRP), which is produced by the liver and associated with inflammation. After the diagnosis is confirmed, the focus must shift to a treatment plan and learning how to optimize quality of life. Who Diagnoses and Treats AS?